Slightly lighter winds today (10 kts Westerly) were ideal for training and trial flights. Fantastic views when towed above the clouds (quite thin Cu between 1800'-2200') with mild thermals (1/2kts ave) above them. Enough to slow down the descent from 4000'. A few pilots were able to use the day for aerobatics practice. Finding gaps between the clouds was quite a challenge! We had a good turnout of members at Steve William's talk on Saturday on Airmanship and Radio. This was followed by several members sitting the Bronze C exam paper. Meanwhile out on the airfield we had a fun day with a K-13, K-21 and Junior all aviating. 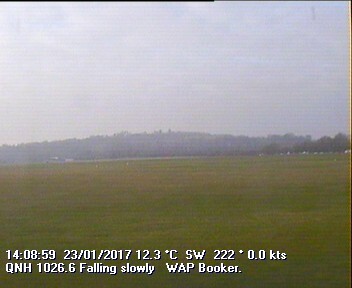 Plenty of strong winds and turbulence provided a good chance to practive aerotows, circuits and landings in rough conditions. No sign of any smoother wave though. Be interesting to see, given the slightly lighter westerlies forecast whether Sunday will see any wave locally. Looking at the satpics, it looks like Scotland will be the place to be, as ftp://taurus.caf.dlr.de/put/wetterbilder/UK/0801270257.uk.jpg shows! .....meaning it was tipping down, but the new roof on the clubhouse kept the rain out of the briefing room which was packed with people eager to hear Alun Jenkins make sense of Coriolis and fronts and lapse rates dry and wet. This was the third in the winter series of Saturday lectures aimed at those wanting to take the Bronze paper, but the 'experienced' pilots in the back row also found it useful. Next week Steve Williams tackles airmanship and RT, don't miss it! Clear blue skies in the morning, 40k viz and a light South Westerly encouraged Booker members into the air on a beautiful January day. The airfield going was officially good to very soft in places with wading birds enjoying the 35 threshold. 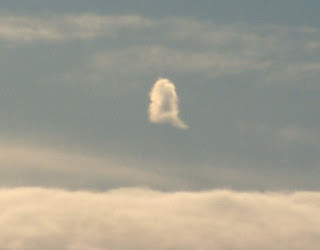 From first thing Didcot was pushing thermals through the inversion, which by afternoon resembled a Cb complete with anvil. BTW did you know why cu's are so called? This one was spotted over the Borstal at 14.30. Well done to Michael Gardner who soared the K18 for 40 minutes in 2-3 kt thermals just after lunch and to Eric, Roger, Rolf and Graham who also enjoyed the conditions, whilst Mike and Arne just spun down through the lift. And thanks to Roland who towed all day! But the star of Wednesday must be Don Harvey who re-soloed in the K13 after a break of 52 years and 9 months! Is this a record? Well done to Don and don't leave it so long next time! First Comp results of the season ? Plenty of flying on Saturday with nice blue skies interspersed with increasing cloud as the day went on. Eventually the intruding front produced an overcast sky and marked the time to put the gliders away. During the morning we had a roomfull of keen aviators attending the Navigation presentation by Gary Nuttall. This was the second in the Bronze C series. Next Saturday's talk (19th Jan) will be on Meterology by Alun Jenkins. The final talk in the series will be on Saturday January 26th with Steve Williams talking about Radio, Airmanship and finishing with the opportunity to sit the Bronze C exam. Busy day today. Graham Saw's popular aerobatics course (first Saturday of the month throughout the winter) was fully subscribed, with various members discovering humpty bumps and quarter clovers and other unusual attitudes. Meanwhile in the briefing room, a group of Bronze trainees (and two AssCat candidates) were learning about principles of flight from Symeon Economou, who gave an excellent exposition of the subject. Various points provoked heated discussion, afterwards some of those attending went off to take up Matt Cook's offer of seeing how it works in practice. Next week's subject is Navigation, with Gary Nuttall, 10am Saturday 12 Jan, in the clubhouse. Club and course flying continues as normal, as long as gravity keeps on working. I've not been up to the airfield for a few days, which is why the blog seems a bit sparse...apparently we have been doing some flying during the week. I just need to encourage a few more bloggers to join in. Reasons for the congratulations ? (1) Congratulations to Booker GC member Ben Flewett who came joint second (with Uli Schwenck) at the FAI World Gliding Championship Grand Prix in New Zealand. 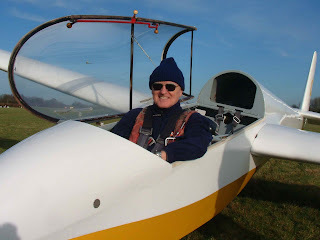 (2) Congrats also to Booker GC member, and enthusiastic instructor, Graham Saw, who has won the 2007 British Aerobatic Association Glider Trophy.